Biographies of Francis and Riversdale Grenfell. 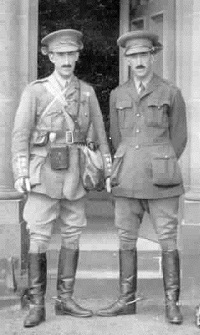 GRENFELL, FRANCIS OCTAVIUS [left] and RIVERSDALE NONUS, born in Surrey on 4 September 1880 were the twin sons of Pascoe du Pre Grenfell, son of Pascoe St Leger Grenfell, by his wife Sophia Grenfell [his cousin], daughter of Admiral John Pascoe Grenfell. In the years leading up to the War, 'Rivy' had trained with Bucks Hussars and at the outbreak of war transferred to the 9th Lancers to join his brother. The twins embarked for France in August 1914 arriving near Mons in Belgium on the 21st. Three days later was to be the first day of the retreat from Mons and Francis was in charge of B Squadron. During the fighting that took place he was wounded and had his horse shot from under him. Subsequently the 9th Lancers were ordered to charge German gun positions and although suffering heavy losses achieved their objective of giving necessary time to others who were able to retreat from Mons. Later in the day Francis offered to lead a volunteer group of officers and men to assist a field battery remove their guns under heavy fire, during which time he was again wounded. For his action in organizing the saving of the guns and for his earlier bravery against the German machine guns he was awarded the Victoria Cross. Whilst Francis was recovering from his wounds in England, 'Rivy' was still serving in France and on 14 September while directing fire on German positions was shot and killed. He was buried nearby in the cemetery at Vendresse. In October 1914 Francis had recovered from his wounds and returned to France to take command of B Squadron and at the end of the month was wounded again and returned to England. He had been deeply affected by the death of 'Rivy' and many of their friends, and before leaving for France again gave a small dinner party in London. The guests included Winston Churchill and John Buchan. In April 1915 the regiment was involved in the Second Battle of Ypres where gas was used for the first time on the Western Front. During the battle on May 24th Francis was shot and died shortly afterwards. He was buried at Vlamertinghe. On that day the 9th Lancers suffered 208 casualties out of the 350 men who went into battle. The twins are commemorated at Canterbury Cathedral and on a stained glass window at Beaconsfield parish church. Francis's medals are in the 9th Lancers museum. The photograph is reproduced from the book ''Francis and Riversdale Grenfell' by John Buchan published by Thomas Nelson & Sons. 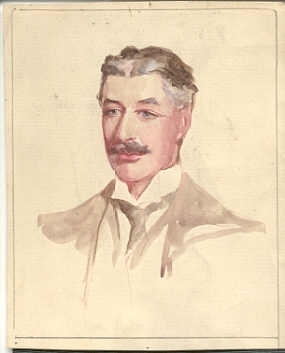 The portrait of Francis Grenfell is in the possession of Penny Watts-Russell.